Lee Sin has been on a steady decline since the preseason began in November, but when Patch 8.4 hit two weeks ago, his performance crashed and burned to an all-new low. He’s now one of the least successful champions in League of Legends, according to stats site Champion.gg. Lee was already falling due to not meshing as well with the new runes as other jungle champions have been, but then Riot removed the Tracker’s Knife in 8.4, sealing his fate. After the removal of the Sightstone in Patch 8.2, the Tracker’s Knife was his only means to ward-jump without using Trinket wards. Without it, he’s hopeless. His winrate was already a subpar 48 percent before 8.4 hit, and it crashed to 47 percent overnight following the patch’s release. To make matters worse, his playrate is now only six percent—the lowest its been in over two years by a wide margin. 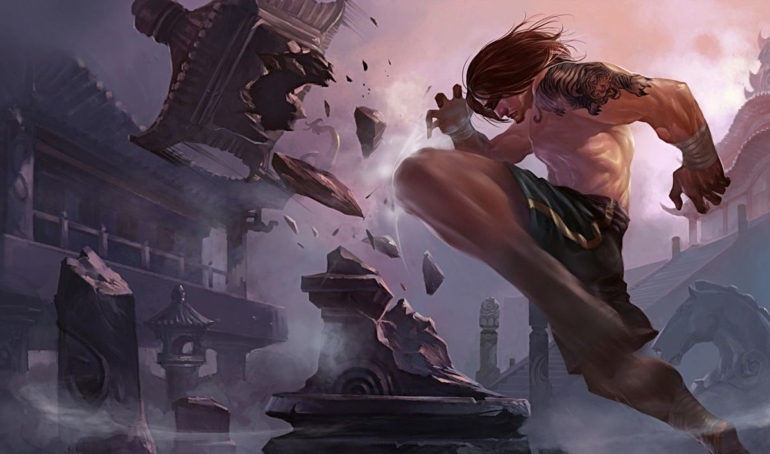 Lee Sin was once one of the most popular champions in both solo queue and in pro play, and now, there’s no doubt that he needs some love from Riot’s balance and design teams. The only question is: what can be done? Without the Tracker’s Knife and the Sightstone, hope seems lost. But don’t worry, there are some decent options to explore in the upcoming few patches. To make up for the fact that Lee simply has a lot less utility than before, the easiest fix is a straight damage or cooldown buff to his primary ability, Sonic Wave/Resonating Strike. This is the most straightforward option, as it boosts Lee Sin’s strengths directly. Typically, buffing an ability like this on any champion can have serious consequences (they OP, yo), but in this case, it might be needed. With only a fraction of the ward-hops that he used to have, Lee Sin’s playstyle is effectively much different, which means a lot of his usefulness comes from his Q now, rather than his W, and his Q could stand to be stronger. The second option, and our personal favorite, is a heavy-handed change to his E, Tempest/Cripple. Out of all Lee’s abilities, his E feels the least satisfactory. His Q, W, and R all make Lee feel like the badass blind martial arts master he is, but the generic and not-very-impactful AoE slam from his E doesn’t deliver. Perhaps this drastic drop in performance could be the excuse the design teams need to redo his E, adding some of the power to that portion of his kit that was stricken from his W.
The third option is the most dangerous to the health of the game, but it’s probably the easiest and most obvious fix to deploy. Simply adding one ward to each jungle item, just one ward, would be enough to help Lee in a big way. It would ensure that he has at least one ward to jump to per fight, but it would avoid the vision-abuse catastrophe that the Tracker’s Knife caused by effectively providing half the amount of wards. The risk is clear—adding even a little vision to every jungler in the game could undo Riot’s plan when they removed the Tracker’s Knife, but it would be a compromise to help out Lee, who feels depressingly unimpressive at the moment. No matter what happens, something needs to happen soon, because he’s in the gutter.